After more than five years of real estate doldrums, there is much to celebrate now that demand is returning to the market. A number of real estate developers have swiftly read the tea leaves and are already making plans to move forward with major projects that could transform downtown Fort Lauderdale or at least move it into an exciting chapter of growth. This shouldn’t be cause for concern– it’s a terrific sign of economic life. One of the most exciting projects presented recently is a three-phased development along the New River that focuses on luxury rental units. Marina Lofts is the brainchild of Miami-based Cymbal Development and its selected designer, Danish architectural phenom Bjarke Ingels Group (BIG). No small plans for this team: they intend to deliver, albeit in thirds over the next seven years, 1000 housing units targeted at a youthful but sophisticated user. As planned, this would give an entirely new vibe to a section of the southern border of the New River that has essentially been lying fallow. What is currently at this location is an architectural condition indicative of local culture. The multi-story marina that houses boats the way many cities warehouse cars was a significant inspiration to the project’s designers. Bjarke Ingels noted, “A vertical marina seems to be such a quotidien approach – it shows how it seems a boat is everyone’s right.” Ingels rightly underscores the apparent normalcy of boat use in our community. Outside of our area, access to marine activities is typically reserved for users with extraordinary resources. Even visual access to water is usually a limited perk for a lucky few. Here, this will be widely available. The stacking of boats within a structure is a very good parallel to the way in which tall buildings can stack living spaces. Common ground, or in this case, common waterfront, is to be shared. Ingels envisions a design that incorporates public space on land and public visual access to water that could greatly enhance the experience at this southwestern parcel along the river. Despite the size of the proposed structures, all users will see the waterfront, especially via the architectural cut through the project. This will be a focal point for not only residential use, but also retail and food service that the entire community may enjoy. It seems hard to believe that it was ever possible for the wonderful asset of waterfront to be so underutilized. Shouldn’t the river always have been the premier choice for high-end uses? The history of downtown Fort Lauderdale – as well as surprisingly many other urban locations – proves this is not always the case. Today, we have a chance to redirect efforts all along this waterfront to make the most of a privileged condition and use this as a magnet to bring a very desirable density to downtown. 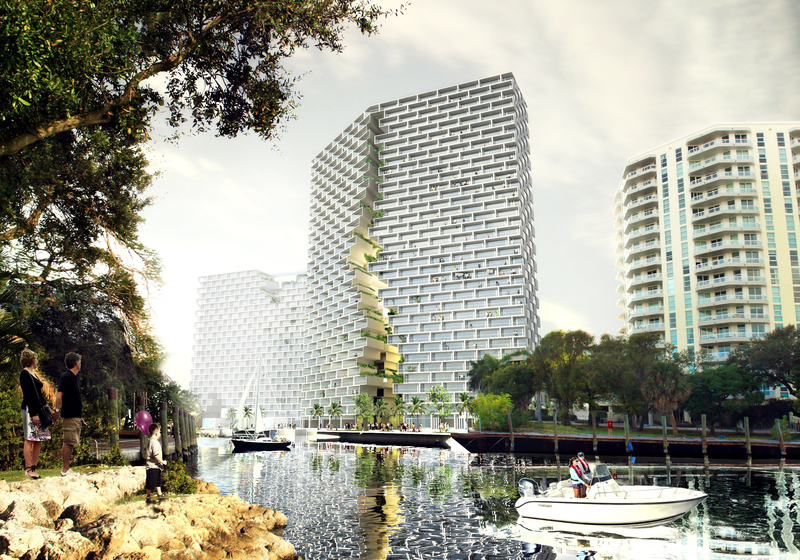 The design of the project has the potential to bring worldwide attention to Fort Lauderdale. BIG is one of the hottest design firms around, having built extraordinary projects globally that both give a nod to modernist traditions while firmly making strides towards a very fresh aesthetic that is unquestionably very 21st-century. Anyone who was fortunate enough to see BIG’s work at the Danish Pavilion two years ago in Shanghai during the World Expo got that message instantly. With an exquisite curved form that contained an elegant narrative on Denmark, the pavilion stood out as one of the finest structures at the fair. For Fort Lauderdale, Ingels proposes a form that is more rectilinear than that in Shanghai. Using the metaphor of bricks, the constituent buildings give each housing unit the status of an individual building block within the façade. Part of that visual surface is disrupted by an architectural device that gives the illusion of bricks tumbling off the building. This dramatic element is not new in architecture, nor is it commonplace. Building static objects that give the sense of movement is a trick that is hard to pull off. While it may not have been top of mind for Ingels during the design process, the history of this sort of architectural maneuver is a long one. Back in the day of the Italian Mannerists the great 16th-century architect Giulio Romano was known to incorporate what seemed to be falling keystones and tumbling columns into some of his work. In more recent times, James Wines of SITE created a series of striking facades for his client Best Products back in the 1970s and 1980s – one of the best known being one which featured crumbling bricks. The constituent elements of the façade at Marina Lofts are in essence the balconies of the loft units, which Cymbal describes as having luxury-level amenities but of modest square footage appropriate to the young, hip crowd he wants to attract. By the standards of many cities the proposed square footage of the units is quite typical. Living in a large space may be far less crucial to these anticipated users than having the opportunity to come home to a striking piece of architecture that offers homes with a view (both inside and out). In truth, urban-oriented dwellers tend to be more focused on the external world beyond their living quarters rather than solely on that of their own interiors. Being part of a vibrant community where there are engaging activities nearby and interesting neighbors with which to mingle is the point of this type of living. There hasn’t been enough of that built in Fort Lauderdale. Now under consideration by the developer and designer is an effort to collaborate with artists to apply colorful designs to the units’ exteriors. This façade will not be simply a series of white boxes. Passionate about both art and architecture, Cymbal is the sort of developer those of us in urban design pray will appear on the scene. He is committed to creating great architecture that makes for a terrific lifestyle for occupants and visitors alike. He even has a home nearby the site on the New River in order to experience the area himself. Cymbal notes the importance of constructing rental units as opposed to condos, which makes sense in terms of both the market, which may not quite be ready for a large inflow of condos for purchase, but also for users who can afford substantial, but perhaps not astronomical, rents and certainly not significant down payments. In the past, those obstacles prevented many younger users from making their homes in the newer structures built downtown. What is equally remarkable about this project is that it signals an important return to a more ambitious architectural approach in Fort Lauderdale. A half-century ago this area was a hotbed of innovative modernism designed by creative architects with supportive builders behind them. That legacy needs to be recalled and used as a catalyst for what may be the next era of large-scale building in the region. Ingels says this project “is a return to that spirit.” That in itself is worthy of popping a cork or two as we look forward to the next wave of building to hit our shores.